The Sweratel RTWIP (RealTime Wireless IP) forms the CORE architecture and the fundamental operational framework of all system elements solution and all Sweratel products. The Sweratel RTWIP enabling-architecture provides the data link communication and information exchange transportation via our efficient IP-Core Network, enabling a self-sustain, self-optimization and expandable mesh communication coverage. The architecture of the RTWIP system is built upon a highly-flexible modular software platform technology. The modular concept features the Macro- and Micro-software modules for the Sweratel complete-end-to-end system products; BS, EBS, WR (Wireless Redistributor), MNC, RNMS, CBS, OLS and future products and system. These create industry-leading state-of-the-art converged carrier-grade wireless broadband networks for the Metro, Rural, Smart Communities, ICT infrastructure, Networked Society- and Connected Society markets. The most flexible Cloud-managed Carrier-grade Wireless Network Infrastructure Solution in the Market today! Sweratel supplies a converged carrier-grade wireless networks solution. These include citywide Wi-Fi networks, urban, suburban and rural networks, ICT infrastructure, public safety networks, Wi-Fi corridors, and smart grids networks. The Sweratel RTWIP system is a cloud-managed carrier-grade Wi-Fi network system that provides an ideal reference solution for network operators and ISPs wishing to deliver premium broadband access to support a range of compelling next generation Smart-phones, Phablets, Tablets, Apps, including 3G/4G (LTE) Wi-Fi offload. The complete end-to-end RTWIP system provides seamless, highly scalable and cost-effective broadband access solution for new entrants from Municipalities, Infrastructure owners and existing network operators and ISPs. With its advanced RTWIP-CORE interface and support for a variety of network architectures, RTWIP delivers the solutions to address the fundamental challenges that have traditionally been barriers to wide deployment of Wi-Fi systems. Specifically, the RTWIP system is designed from the ground-up to successfully compete in the exploding “new generation” of wireless broadband that drives the “Internet of Things” (IoT). As network operator’s customer base grows, the RTWIP cloud-managed solution will scale easily with the addition of new clusters. 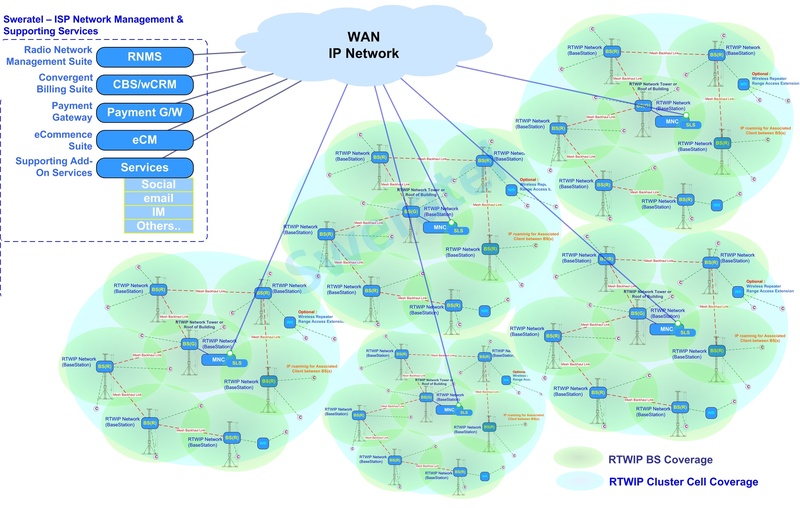 The architecture of the RTWIP system is based upon a highly flexible, modular software platform, working parallel with Cloud-managed Convergent Billing Suite (CBS) and Mobile Off-Load System (OLS) to enable a “success based” incremental capital model; that is, network operators can initially rollout service with a low-cost minimal configuration then easily, and non-disruptively, “plug in” capacity as subscriber growth dictates. In this way, incremental capital expense for capacity growth tracks with incremental revenues from subscriber growth.